Would you like to join us for our regular volunteer workdays at the Dyfed Permaculture Farm Trust? The Trust has a 22 acre farm straddling the villages of Cwmpengraig and Penboyr. The farm comprises wildflower meadows and mixed grazing pasture bordered by mature hedgerows (particularly Laburnum), 3 acres of woodland, fruit and vegetable growing areas, permaculture inspired plantings and a multi-purpose wooden pole barn, compost toilets and solar showers. One of the ways that the land is managed is through our monthly workdays. We carry out a variety of activities on workdays. 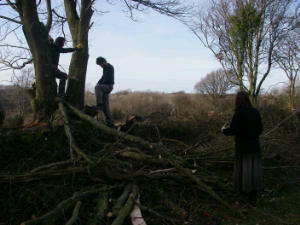 Past activities include hedge laying, fencing, coppicing, clearing and small building projects. It is a great chance for you to learn some valuable smallholding / permaculture skills in an informal setting or share those you already have, and help us develop the Trust land. Every workday includes a bring and share feast! Workdays are usually held on the second Sunday of every month, starting at 11am and finish around 4pm. The programme for this winter is below. The activities are subject to change, depending on weather and circumstances. Sunday 10th March. Assessing and clearing an area in preparation for creating a Forest Garden. As workdays are subject to change, please contact us to let us know if you intend to come. Please bring a pair of work gloves and wear suitable work clothes. If you have any suitable tools, please bring those as well. And of course, bring a contribution for the shared lunch. If you would like to come to any or all of the workdays or have further questions, please contact Michelle on 07813 464990 or email michelle_laine(at)yahoo.co.uk. I can email out directions to the farm if needed. This entry was posted in Uncategorized and tagged Dyfed Permaculture Farm Trust, learn, Permaculture, volunteer. Bookmark the permalink.